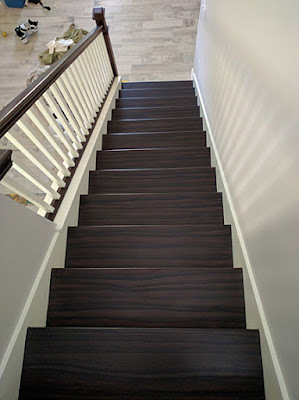 The stair project is complete. 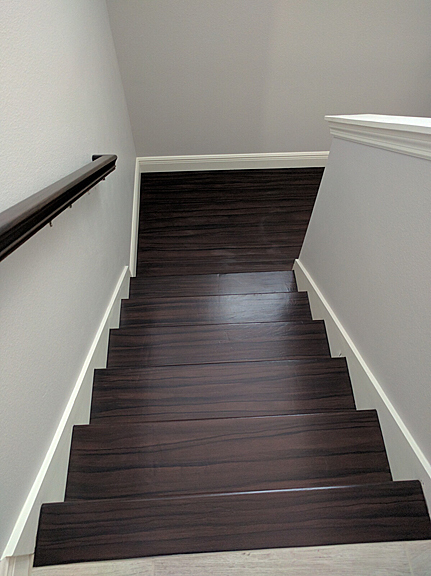 I painted the stairs, the landing and the handrails to look like an espresso wood. 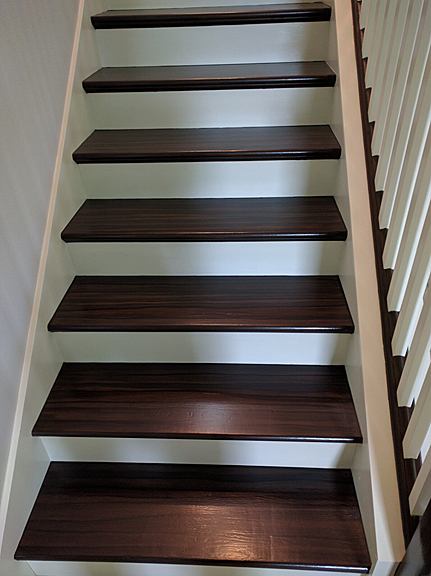 Creating this espresso wood tone on the stairs was a challenge but in the end they came out looking great. One of the biggest challenges with this project was that I had to stand on a lower step and bend over to paint a step two up from the one I was standing on. Bending over all day was a back breaker for sure. 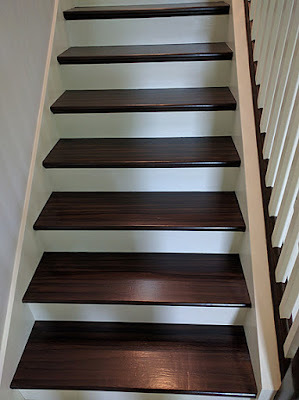 I tried to sit on a lower step and paint one higher but sitting did not give the angle I needed to create the wood grain look. This series of photos starts at the top of the stairs and works its way done. If you look at the previous post on this which I posted last week, you can see the huge difference it made creating this wood look on the stairs as opposed to the battleship grey they were when I started. All in all creating the wood grain on the stairs gives this section of the home a great new look. 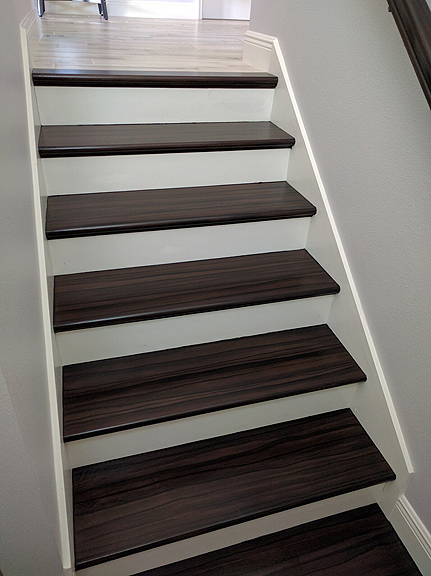 The stairs are gorgeous work as always. What did you coat them in to resist wear over the years, and how long do you think it will be before they need to be touched up? You can find it other places this link is just to show you the can. They make an oil base but I only use the water base one. Never yellows and dries really fast. I put a coat on and 2 hours later I could walk up the stairs in my socks and put another coat on. 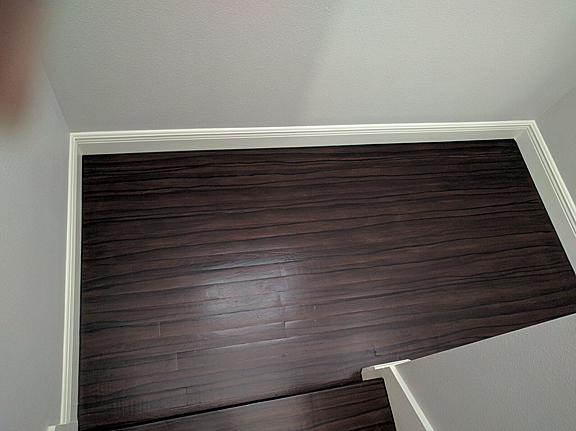 Takes 4 coats for the floor jobs however. It should last a really long time. This is the same product I use on all my cabinet jobs. I am working on a kitchen island now and this is what I use to clear coat. With kitchen cabinets I only use 2 coats. It is a thin product so don't let that throw you, it works great. Being thin as it is it levels out smooth as can be. I use a Wooster Chinex brush for it (mostly a 2 inch, thin angled) which you can get at HD or other places. Just make sure you wash out your brush 3 times with soap and water because this stuff has the best adhesion of any product I have ever used and will freeze your brush if it's not completely washed out. If you look at part one ( http://www.everythingicreate.com/2016/06/painting-stairs-to-look-like-wood-part.html ) there is a picture of how I taped off each stair thread. There are basically three parts to the treads. 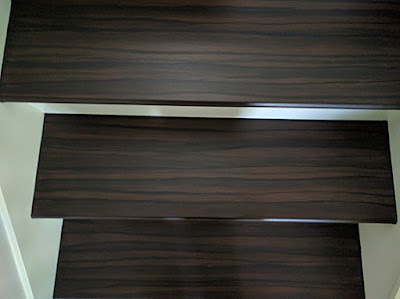 The thread itself, the riser which is the vertical board between the treads and the skirt. 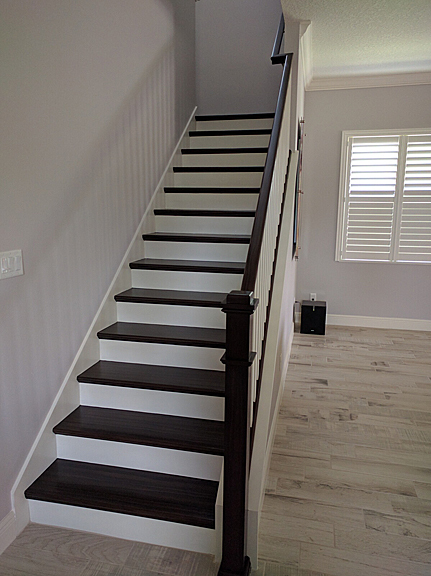 The skirt is the board that runs the length of the stairs on either side of the treads. You can see I taped off each tread. 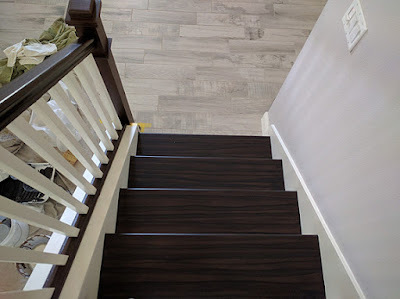 To get the wood grain to go from side to side without getting a stopping or starting look you have to put the brush up against the taped off skirt on side A (lets' say) and go across to the other side, side B, as close as you can. Then you immediately start on side B right up to the tape and go back towards side A. That way you get overlapping paint strokes. The trick and skill play into it by making the two strokes blend in so it doesn't look like an over lap paint stroke. In order to do that you have to work with a pretty wet brush for one. Not dripping wet but pretty wet which means you water down the paint some. Then you have to be able to 'feather out' the paint strokes. 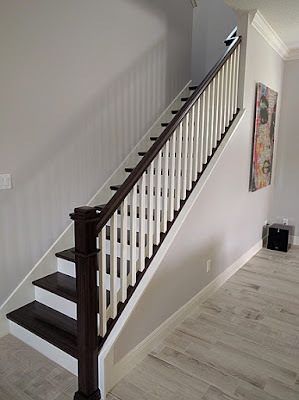 By that I mean on the second paint stroke going from side B back to side A you have to ever so slightly lift the brush until it stops making contact with the tread. Most time I go back and forth a few times to get it to look continuous and not overlapping. 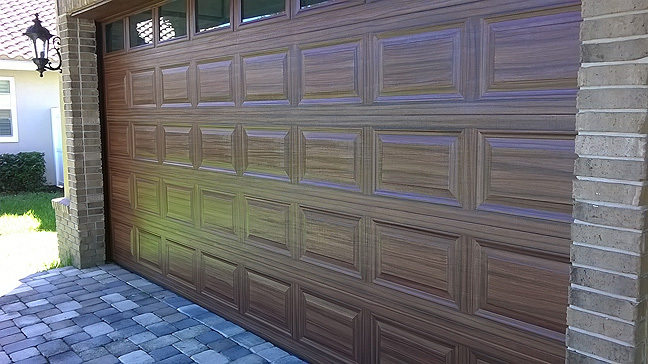 When you water down the paint and press hard on the surface the bristles of the brush spread out and create the wood grain look. That was step one. After that dries, and I use a hairdryer to dry it immediately, I then add the dark grain lines with by using the 'knife' edge of the brush ( I use a Wooster 2 inch thin angled brush ) and doing the same thing only it's creating a single grain line at a time. That is step 2. I dry that and then add a further step by going and adding a much more thinned down line next to the really dark grain lines. Once each tread is done the grain goes from side to side but the final step is to make a line about 1/8 of an inch that goes from back to front. 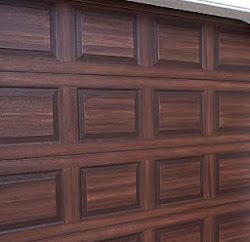 This is a dark line that goes on either side right up against the tape and it will hide any start marks of the brush. It's a four step process but with a hair dryer you can do one tread then move to the next. 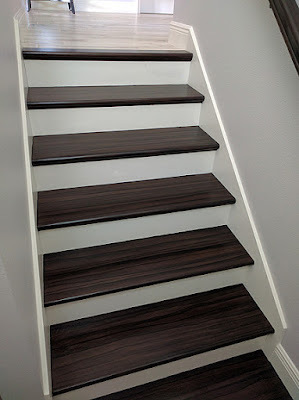 This is the exact thing I'd love for my stairs (currently a disgusting baby poo brown - I don't know what the prior owners of this house were thinking! ), but I 1) have four cats and 2) have little patience. I'm impressed by and envious of your work!